Alasdair Price, a student from the first cohort of the Quantum Engineering CDT, was one of four finalists in the Safe and Secure Cyber Security category for his work on integrating quantum key distribution with real-world communication networks, development of next-generation protocols, and advancing the state-of-the-art in chip-scale devices. EPSRC's Connected Nation Pioneers, which took place at the Museum of Science & Industry in Manchester, is judged by representatives from DSTL, Facebook, BT, Samsung, Huawei, Thales, Amazon and NVIDIA, and aims to “recognise exceptional UK doctoral students whose research contributes towards the development of a Connected Nation". Alasdair presented an initial expression of interest, a 3-minute video pitch, and finally a 2-minute pitch in person. 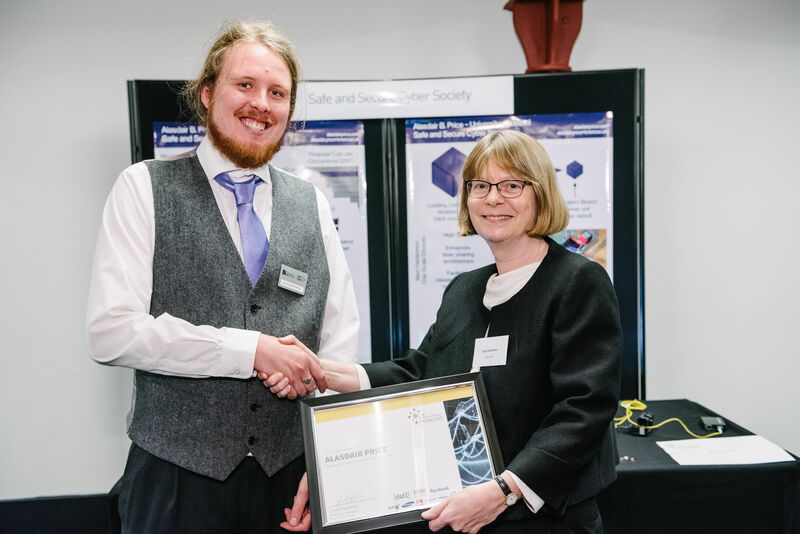 He was presented with a certificate by Lynn Gladden, the Executive Chair of EPSRC.